Are you seeing double? Nope – that’s just the return of the cult favorite musical, Side Show, which opens this fall on Broadway at the St. James Theatre. Directed by Academy Award and Golden Globe winner Bill Condon (Chicago, Dreamgirls, Twilight: Breaking Dawn Parts 1 and 2, Gods and Monsters) making his Broadway directorial debut, this exciting new staging of Side Show has “the flash and velocity of a Hollywood motion picture”and “puts gripping emotion in the main tent” (Los Angeles Times). Side Show will begin Previews on Tuesday, October 28 with an official Opening Night on Monday, November 17. On sale beginning August 13 at www.SideShowBroadway.com. Featuring a score of “supercharged songs” (Charles Isherwood, New York Times), Side Show includes new music by multiple Grammy Award winner, Academy Award, Golden Globe, and Tony Award nominee Henry Krieger (Dreamgirls), with book and lyrics by Tony Award nominee Bill Russell, additional book material by Bill Condon. It was also announced that, on the heels of their star turn at the John F. Kennedy Center for the Performing Arts, Erin Davie and Emily Padgett will reprise their leading roles. Bill Condon’s new production reimagines the world of Side Show, set against the backdrop of 1920’s and ‘30’s show business that seamlessly blends the worlds of carnival, vaudeville, and Hollywood glamour. 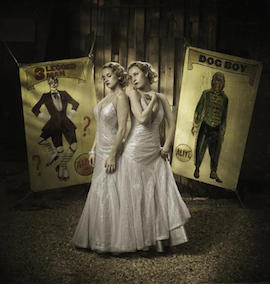 Side Show is inspired by the remarkable true story of the Hilton twins, Daisy and Violet, who were legends in their time and the highest paid performers on the vaudeville circuit. Side Show is their heartwarming search for first love and acceptance amidst the spectacle of fame and scrutiny under the spotlight. The original production, beloved by legions of fans, premiered on Broadway in 1997, and was hailed as “Something to marvel at” (Ben Brantley, New York Times). It went on to earn four Tony Award nominations including Best Musical, Best Original Score of a Musical and Best Book of a Musical.